Many people asked us to do more HDR video after the surprisingly positive reception of our Forza 7 ones a few days ago. Needless we don't have anymore HDR footage from upcoming games, but we have a lot of amazing looking PS4 Pro title to show off. 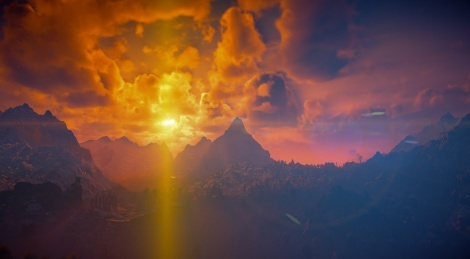 I don't think many people will be surprised by the fact that we start with the still incredibly amazing looking Horizon: Zero Dawn, and these two videos showing a sunset, and a very high contract Cauldron sequence (slight spoilers in that one). Update 6: After inFamous: Second Son, Uncharted 4: A Thief's End, Ratchet & Clank, WipEout Omega Collection, The Last of Us, Tom Clancy's Ghost Recon: Wildlands and now a third video of Deus Ex: Mankind Divided. As usual now, these videos will only work as they should on a HDR screen. Simply copy the file(s) to a USB media and plug it into your TV or Xbox One S. You can also use a Chromecast Ultra or a Samsung TV to watch the video on our Youtube channel, but the quality won't be as good. It's also important to mention that these videos are still very much experimental for us, and we are still learning and changing the way we encode them, so expect us to fail too! Im guessing you guys are using the Shogun Inferno for these? The Infamous video looks a bit dark. Like shadow detail is being killed a bit. I didn't know Second Son received Pro upgrades. I thought only First Light did. I'll have to re download Second Son to my Pro and compare to the video here. Yeah it looks dark for me too. Thanks guys for all your hard work. I have been coming here as my primary destination for new games media for forever now and you never disappoint. I just downloaded the game on my Pro and it just is dark I guess. I don't remember the game being that dark when I played it on whatever TV I had at the time I first played it. Either a Panasonic or Samsung plasma. But yeah, HDR on my X930E it definitely looks dark. It's probably best to use HDR Standard when played from a USB stick in a video app on the TV? 65B6 in this case. Do you guys have a xbox one s? Any chance for some forza horizon 3 hdr movies? I sadly don't and the Shogun is with me at the moment. I don't understand HDR everyone says it makes colours pop but on 3 TVs I've tried HDR it just seems to darken everything and nothing is popping. Are the TVs you've tried HDR capable? If you're trying to play these on standard non-HDR TVs you're going to get weird results. You also need to be aware that HDR needs calibration on most TVs, specially for games. If you check NeoGAF, Reddit and Google, you will see that for games, many need to be calibrated on a case-by-case basis. Though it's easier to manage with multiple profiles. Games in HDR are still in its infancy and results will vary from game to game, just like other technical aspects like AA, DoF, etc. Try reading some guides on HDR calibration and then changing settings till you find a result you like. PS. I found this site with many videos in 4K, HDR, 10 Bit, 3D, etc. in a NeoGAF thread. It's a cool idea to use them to test TVs, and to calibrate TV settings. Just download them to a USB and test different settings. They are, I even get a little HDR logo in the info but when these games launch and PS4 settings say my TV HDR is 2k/4k supported. Yes I always try to tinker with settings when HDR enabled game launches but nothing ever looks as good as my default settings to be honest. It just feels like it turns down brightness without popping anything out, like the opacity went down or something. Maybe it's more "natural" that way but unfortunately I haven't got HDR ever to look in a way that makes me think "oooh, that looks way better with HDR". I will try those demos later this evening, thank you. What are you doing?! Haven't you learned anything?! Just put some big ice pillars in the same room as the PC and let it rip. Or better yet, put the PC in a frozen room. Problem solved! Well I'll tell ya I for one really appreciate that y'all are doing this. I have no idea what the percentage of users is here who actually own an HDR display, but for those of us that do, this is very welcome. Looking forward to your Nex Machina vids. No HDR support on PC means a PS4 purchase will most likely be in order unless the game has serious performance issues or something on the Pro. Very good work Gamresyde, you guys are doing Lord's work for the uninitiated :). Hope 4k/HDR gets widespread more so all games from here and out would support it.